So I ended up having to stay late at work tonight. I was planning on cooking dinner, but by the time I walked out of the hospital I lost all motivation. Chinese takeout to the rescue! Had my usual - chicken wings with pork fried rice, hot & sour soup, egg roll. Also got an order of pork because I wasn't piggish enough. And no to worry, I ordered M's usual as well - vegetable lo mein and vegetable egg roll. As with any Chinese takeout, you get the sauce packets. I really don't need them and I usually tell them not to give me any. 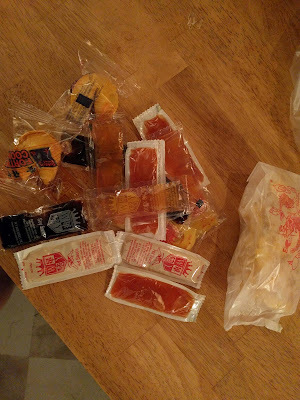 We used up all of these, but they skimped out on the duck sauce. Four is not enough for the two of us.